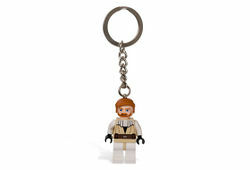 Obi-Wan Kenobi Key Chain was released in July 2008 as part of the The Clone Wars line. Included is on Obi-Wan Kenobi minifigure in his Clone Wars form on a key chain. Facts about "852351 Obi-Wan Key Chain"